B D AND M (1960) The 13 ton 35 foot wooden gas screw fishing vessel B D and M stranded and was lost in 1960 opposite Sunny Point Cannery on Gravina Island, Ketchikan. BABS (1974) The oil screw Babs foundered and was lost September 30, 1974 at Sullivan Rock. An anchor was put out to try to hold the Barbara but the strong breeze piled them onto the rocks before the anchor could take hold. The crew stayed perched on the rocks all day until seen by the Mail Boat Carmen and rescued. The vessel, valued at $7,000, was deemed a total loss including fuel and stores. Additional Information: Tonnage 29 Gross 26 Net, Built 1916, Registered Ketchikan, ON 208434, Master Jim Lou of Hunters Bay Cannery, Owner Northwestern Fisheries Company of Seattle, Cargo none. BARBARA JEAN (2002) The 42 foot seiner Barbara Jean caught fire and was lost July 5, 2002 near Point Baker in Frederick Sound. The vessel burned to the waterline and sank in 30 feet of water. The only person on board was rescued by the fishing vessel Ruffies One who also helped in the attempt to extinguish the flames. The master of the Barbara Jean was transported by Coast Guard Helicopter to Juneau for treatment for smoke inhalation. BARBARA LEIGH (1992) The 42 foot cod trawler Barbara Leigh sank at Noyes Island January 12, 1992. An outrigger collapsed and caused the vessel to list and sink. Edward Lander (63) was lost. BARBRO D (1962) The 8 ton 30 foot wooden gas screw fishing vessel Barbro D foundered February 11, 1962 at Juneau. BARNES (1918) It was 5:30 p.m. on Friday June 21, 1918 when the gas screw Barnes caught fire and was lost off Tolstoi Point in Clarence Strait. In the wreck report filed by her master, M L Burke of Lake Bay, the fire started in the hot box and quickly spread throughout the wooden vessel. One Pyrene and two powder fire extinguishers were expended on the flames in an effort to quench the blaze but to no avail. The crew of four abandoned the Barnes in search of aid but when they returned aboard the gas screw Irene Barnes their vessel had disappeared. BARRACUDA (1954) The 17 ton 40 foot wooden oil screw fishing vessel Barracuda foundered November 15, 1954 between Split Island and Onslow Island. BEACHCOMBER (1951) The 43 ton 58 foot steel oil screw Beachcomber foundered October 15, 1951 on a trip from Yakutat to Juneau. BEAVER (1935) The American oil screw Beaver foundered at 7:30 a.m. Sunday October 27, 1935. She was on a fishing trip out of Port McArthur mastered by Einer Hauneg of Port Alexander assisted by one crewman. They had brought 1600 pounds of fresh caught salmon onboard valued at $287 when the Beaver sprung a leak and filled with water. The vessel, valued at $4,000, foundered one and a half miles south of Point Crowley and became a total loss. There was a 35 mile an hour northwest wind blowing and the Beaver went down rapidly, the crew narrowly escaping with their lives. BEILBY (1956) The 15 ton 46 foot wooden gas screw fishing vessel Beilby stranded and was lost October 27, 1956 at Point Lookout. Comment: This vessel may have been named the Bell E.
BELLE-TECH (1999) The 38 foot fiberglass salmon fishing vessel Belle-Tech grounded and was lost July 19, 1999 on Gilanta Rocks in Dixon Entrance. Both crewmembers escaped to a small boat and were rescued by the U S Coast Guard cutter Liberty. BEN B (2001) The 86 foot fish tender Ben B was consumed by fire and sank July 27, 2001 near Shrubby Island in Snow Passage 30 miles southwest of Wrangell. The two crewmembers aboard abandoned ship to a life raft. They were rescued by the fishing vessel Middleton and transferred to the cruise ship Vision of the Seas. A faulty battery charger was reported to have caused the blaze. BERING SEA (2003) The 45 foot halibut longline vessel Bering Sea stranded and was lost March 21, 2003 on the northwest coast of Yakobi Island near Cape Bingham. All three crewmembers and a dog abandoned ship to a life raft and were rescued by a U S Coast Guard Helicopter and transported to Juneau. BERNICE (1948) The 14 ton 35 foot wooden gas screw fishing vessel Bernice was consumed by fire April 3, 1948 at Carroll Inlet near Ketchikan. BERNICE (1983) The fishing vessel Bernice flooded and sank August 24, 1983 approximately 20 miles southeast of Icy Bay and Cape Yakataga. BERTHA (1916) The 9 ton 30 foot fishing vessel Bertha foundered in Klag Bay in September of 1916. The one person aboard at the time of the disaster made it to safety. BERTIE II (1963) The 12 ton 36 foot wooden gas screw fishing vessel Bertie II burned November 19, 1962 at Tenakee Springs. BERTRAM I (1977) The Department of Public Safety patrol boat Bertram I drifted without power and sank in heavy seas January 25, 1977 in Portage Bay, 21 miles west of Petersburg. BESSIE (1926) It was 11:30 in the morning on Sunday October 24, 1926 when the engine aboard the gas screw Bessie backfired catching the vessel on fire. There was a strong southeaster blowing and seas were rough three quarters of a mile off of Wards Cove Cannery where the incident occurred. The crew endeavored to quench the fire with Pyrene extinguishers without result. The Bessie burned to water’s edge and drifted ashore near Wacker City. The crew of two escaped but the vessel, valued at $7,000 became a total loss. BESSIE M (1935) The wood hulled gas screw Bessie M caught fire Tuesday July 18, 1935 at 1:30 p.m. while at the float dock at Excursion Inlet. No one was on board at the time. The vessel was towed away from the dock and a hole was chopped in her side subsequently sinking the Bessie M and “checking the flames”. Because of the sinking, her engine and the lower part of the hull were saved. The cause of the blaze has been attributed to “gas fumes”. BETTY (1951) The 16 ton 43 foot wooden gas screw fishing vessel Betty struck a reef and was lost October 19, 1951 one mile off the east coast of Bronson Island. BETTY S (1964) The 12 ton 38 foot wooden gas screw fishing vessel Betty S foundered in 1964 off of Ketchikan. BILLY (1902) The wood scow Billy drug anchor in a 40 mile an hour storm about midnight on August 13, 1902 and piled up on the rocks becoming a total loss. The vessel had been left at anchor the day before, three miles north of Point Alava at the southern tip of Revillagigedo Island for fishermen to load salmon into. BILLY B (1996) The 30 foot fishing vessel Billy B went awash in the surf and sank December 2, 1996 off of Warren Island near Klawock. Both crewmembers made it to safety. BINKI (1987) The 43 foot fishing vessel Binki rolled over and sank July 25, 1987 south of Admiralty Island. Four crewmembers were rescued by two passing fishing vessels the day after the disaster. One crewmember was plucked from the water by a United States Coast Guard Helicopter. Lee Welsh(25) of Del Mar, California was lost. BIRD (1999) The 52 foot sailboat Bird was believed lost November 5, 1999 in Glacier Bay with one person aboard; David Poole of Mt. View, California. BLUE BIRD (1935) The gas screw Blue Bird, owned and operated by Joe Barnes of Ketchikan, caught fire and was lost on Wednesday August 21, 1935 at 5:00 p.m. in Cholmondeley Sound. The crew of four escaped but the Blue Bird, valued at $2,000 was a total loss. The report filed by Barnes lists a flooded gas tank as the cause of the blaze. The diesel screw Atlas offered what assistance they could. BLUE FIN (2004) The 42 foot longline fishing vessel Blue Fin capsized and was lost October 31, 2004 two miles south of Bold Island near Ketchikan. Both of the occupants of the Blue Fin were rescued from the overturned hull wearing only life jackets. The Hall Point was the Good Samaritan Vessel who pulled the two crewmembers from the water. The Hall Point fouled their propeller with a line from the Blue Fin and required a tow to Ketchikan from the Coast Guard vessel that responded from the Ketchikan Station. The Blue Fin was believed to have sunk in 600 feet of water. BLUEBIRD (1987) The 46 foot fishing vessel Bluebird flooded and sank in a snow storm December 10, 1987 approximately 12 miles southwest of Sitka. Winds were blowing at 70 miles an hour and seas were at 30 feet. Jim Blades (33) and his six year old son Clinton were rescued by a U S Coast Guard Helicopter in the midst of these impossible conditions. BLUEFIN (1959) The 48 foot seiner Bluefin was consumed by fire March 14, 1959 on Station Island in Sumner Strait. Owner Burt McKay was delivering supplies to a logging camp on Station Island and not aboard at the time of the disaster. He escaped in a skiff to nearby Vank Island. BOB (1910) The 8 ton 34 foot schooner Bob foundered and became a total loss at Juneau in June of 1910. The value of the vessel with cargo at the time was $3,000. BOBBY LEE (1990) The 32 foot wooden fishing vessel Bobby Lee became disabled in heavy weather and sank January 28, 1990 in Frederick Sound. Both crewmembers were hoisted off of the vessel by a U S Coast Guard Helicopter. BONNIE JEAN (1922) The 11 ton 36 foot gas screw Bonnie Jean foundered in Scow Bay November 15, 1922. No one was aboard at the time of the loss. BOOMER (1949) The 8 ton 35 foot wooden gas screw fishing vessel Boomer burned near Cape Georgiana August 26, 1949. BORNEO (1819) The 233 ton fur trading ship Borneo was wrecked in a gale near Cape Muzon January 28, 1819. She had left Boston December 3, 1817. Her officers and crew were taken aboard the ship Volunteer after escaping local natives. The ship and her entire cargo of furs were lost. The survivors were taken to the Sandwich Islands. BREMERTON (1963) The gas screw Bremerton burned September 27, 1963 in Kasaan Bay. BRIXHAM (1898) The 530 net ton iron steamer Brixham stranded at the southeast end of Blashke Island, Clarence Strait, near Zarembo Island, at 2:47 a.m. on Thursday October 13, 1898 and became a total loss. She had departed Seattle October 8, 1898 with 18 passengers, 42 crewmen and a 240 ton cargo of mostly hogs, sheep and cattle, bound for Dyea and Skagway. The contributing factors listed in the wreck report include a southeast gale, a dark, stormy, rainy night and the vessel overran her distance. The casualty took place before any danger was realized. 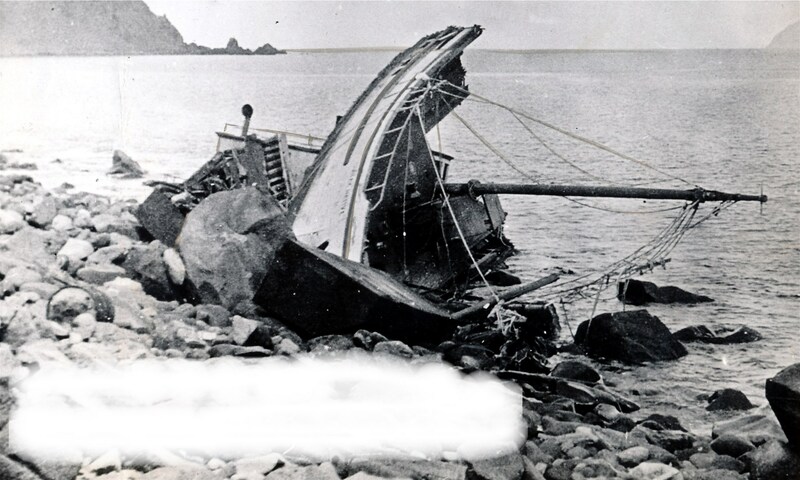 The crew and passengers all landed on Blashke Island and were spared, but the Brixham, valued at $75,000 and her cargo, valued at $12,500, were lost. BUCKEYE (1926) The American gas screw Buckeye was destroyed by fire while at anchor in Whiskey Cove on the north shore of Pennock Island just south of Ketchikan at 2:30 p.m. January 26, 1926. The vessel’s master, Glen R Day of Ketchikan heard an explosion found the vessel on fire. He attempted to douse the flames with fire extinguishers without success. He was soon assisted by the U S Coast Guard Cutter Cygan and several men from General Petroleum Corporation. They sank the Buckeye to put out the blaze. An accident report was filed the following day at Ketchikan by her master. BULL MOOSE (1969) The 47 foot purse seiner Bull Moose capsized and sank July 20, 1969 in Glacier Bay near Point Gustavus, Icy Strait. David Burns (24) of Studio City CA and Monte Boden (20) of Seattle were lost. Four other crewmembers were rescued by another fishing vessel. The Bull Moose was on her way to Bartlett Cove when the disaster took place. BUSY BEE (1938) Richard Young, owner and master of the vessel Busy Bee, and three crew narrowly escaped with their lives while fishing July 13, 1938. The crew of four had left Todd on Tuesday, July 12, 1938 on a fishing trip. The following day, after catching 10 to 12 tons of fish, the overloaded Busy Bee foundered inside Kelp Bay as they were leaving. There was no wind and seas were calm but the vessel filled too quickly to do anything. Assistance was rendered by the gas screw Redoubt who helped the crew get away from the wreck.